Eyelid droop, or ptosis, is a condition which occurs most commonly as an effect of aging. Other factors that can contribute to the condition are previous surgery of the eye or eyelid, long-term contact lens wear, neurological conditions, and trauma. Patients who have eyelid ptosis commonly complain of an inability to see the upper portion of their visual field, which has been blocked by the drooping eyelid. Complications associated with this can lead to car accidents, due to an inability to see traffic lights, as well as accidents around the house. Patients can also lose the ability to read, especially later into the night. Other complaints patients commonly have are chronic headaches, brow aches, and tiredness due to the stress placed on the forehead which is constantly raised in an effort to aid the eyes in opening. Many patients are unaware that this condition exists, as it is a slowly progressive ailment. Patients may also be unaware that if a portion of their visual field is obstructed by their drooping eyelid, insurance carriers will “cover” reimbursement for repair of this condition. Dr. Selem will often place muscle-stimulating eye drops in his patient’s eyes at consultation. This provides the patients with a preview of their surgical result and aids them in making an informed surgical decision. During this procedure, a 1 cm thick contact lens is placed over the eye to prevent the possibility of any mishap to the eye. 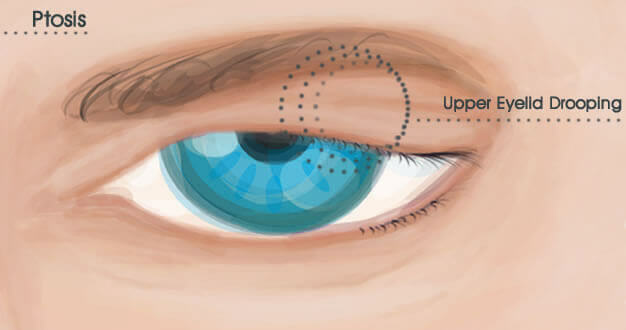 The upper eyelid is then turned over so Dr. Selem can access the muscle responsible for raising the eyelid from the inside. By performing the surgery from the inside, Dr. Selem creates an “invisible incision,” with no visible scar on the surface of the eyelid. The sutures that are placed inside dissolve on their own in 5 to 7 days, and patients are commonly seen in the office at 1 week and 2 weeks after surgery. This procedure can be performed in the office with the patient under local anesthesia, or at an outpatient surgical facility. The surgery takes approximately 60 minutes, and patients should expect to have swelling for up to 7-10 days. Dr. Selem ensures that patients have ice-packs placed over the eyes after surgery, which aid in the healing process. Dr. Selem also prescribes eye drops and eye ointments to aid with any dryness of the eye that may develop in the first 2 to 4 days post-operatively until the eyelids re-establish their normal tone. Patients should also take comfort in knowing that no patches are placed over the eyes. This procedure is commonly performed with an upper eyelid blepharoplasty, which removes the excessive skin commonly accentuated after a ptosis procedure. How Do I Get Started with Eyelid Ptosis Surgery? Dr. Joseph Selem and the staff at The Selem Center for Ophthalmology & Plastic Surgery would be happy to help you set up a private consultation to discuss eyelid ptosis surgery. Schedule an appointment online or call us at 305-444-0221.